Applying body lotion is sometimes neglected and is not considered as important as moisturizing your face. However, applying lotion to your body is an integral part of any healthy daily skincare routine. Regularly moisturizing your whole body helps keep your skin feeling smooth and soft and looking bright, as well as prevents visible signs of aging from developing prematurely. 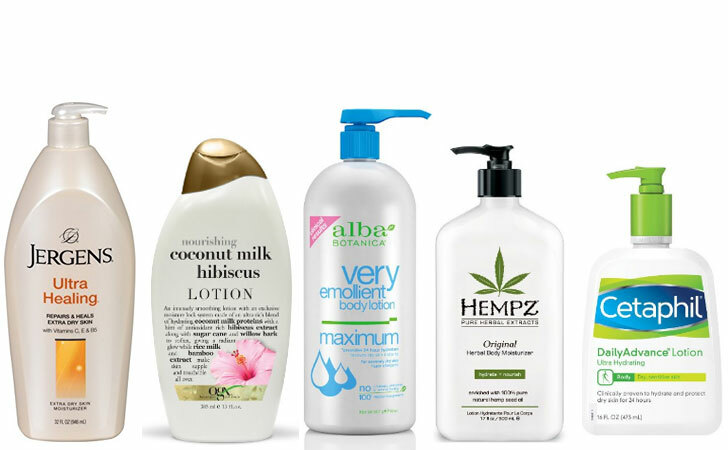 To find a body lotion that complements your skin type, read the following body lotion reviews to learn about the current top ten best body lotions. 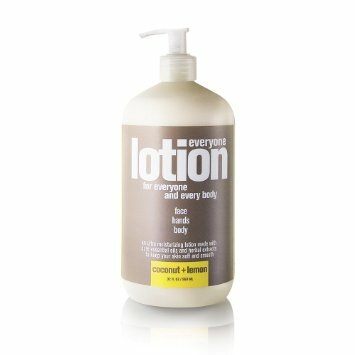 Body Lotion Review: When you wash your hands, the warm water and soap can strip them of their moisture and dry them out quickly. This drying problem can be solved with the Puracy body lotion, which locks moisture into your skin and keeps it there even after you wash your hands or take a shower. Infused with vitamin E and shea butter, the lotion naturally and organically hydrates your skin to keep it feeling and looking soft and smooth all day long. Even if you have sensitive skin, it won’t be irritated by the Puracy lotion, which is formulated without any parabens, phthalates, synthetic fragrances, dyes, silicones, formaldehyde, petrochemicals, or other harsh ingredients. Natural moisturizing ingredients can be a lot more effective than harsher, synthetic chemicals that are often infused into body lotions. Plus, they won’t irritate your skin or cause blotchiness and redness. 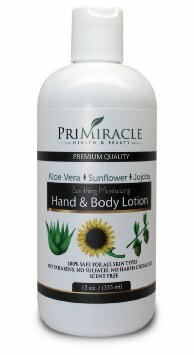 Formulated without sulfates, parabens, or other harsh chemicals, this body lotion from PriMiracle instead includes a blend of natural moisturizing ingredients, including aloe vera extract, sunflower oil, jojoba oil, and several essential vitamins. Lightweight and fragrance-free, the lotion gently but deeply moisturizes your whole body and keeps it hydrated without requiring reapplication for an extended period of up to twenty-four hours. Intense and fast-acting, PriMiracle’s top-rated body lotion combats and eliminates dry, flaky skin, excema, and other rough skin conditions quickly and gently. Greasy residue can take all the fun and relief about moisturizing your body. No one wants to go around looking like they’re sweating all over their body, but many effective body lotions don’t absorb into your skin quickly enough and can leave you looking greasy and feeling sticky. 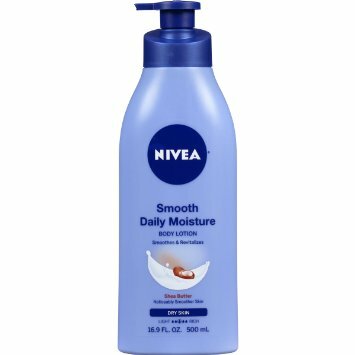 Combining a lightweight formula with intense, effective hydration effortlessly, this NIVEA body lotion absorbs into your skin almost immediately after you apply it without leaving the slightest residue behind. It penetrates deeply into your skin and offers extremely long-lasting moisturization that leaves your skin feeling soft, smooth, and oil-free. Finally: a clinical-strength and clinical-approved body lotion formula that’s available in your local drugstore. 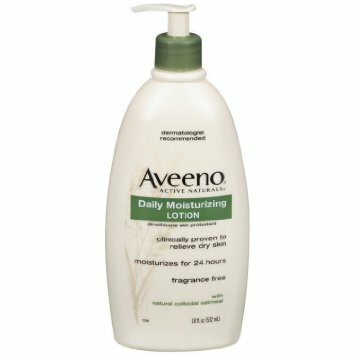 This Aveeno body lotion won’t smother your skin like many clinical-strength formulas do, but it will leave your whole body feeling as soothed, soft, and smooth as the most intense prescription moisture cream. Gentle, lightweight, and fragrance-free, this lotion is recommended by professional dermatologists and has been clinically proven to relieve extremely dry skin. Its moisture lasts for up to twenty-four hours after you apply it and it works actively throughout that entire period to soften and hydrate your skin to combat roughness and dryness. Sometimes, fragrance-free, intense hydration isn’t all you want out of a body lotion. Body lotion should be enjoyable to apply and wear and should leave your skin feeling clean and refreshed. There’s nothing wrong with a scented body lotion, as long as its effective, too! This body lotion from EO combines effective hydration with gentle fragrance; it is a completely natural product that is infused with a blend of pure, organic essential oils that give it a light coconut lemon fragrance. As a plus, the lotion is formulated without parabens, polyasorbate, gluten, gmos, and other harsh, synthetic chemical ingredients. Herbs are nature’s natural soothing, healing ingredients. They have been used for centuries to treat various medicinal problems and are frequently used today to calm anxiety, reduce stress, and increase feelings of lighthearted contentment. Enriched with pure, natural hemp seed oil as well as a blend of other assorted herbal ingredients, this lotion from Hempz offers essential proteins, antioxidants, vitamins, and minerals to your skin. These ingredients help condition and hydrate your skin to leave it feeling silky and soft after application. Extremely dry skin can cause rough, flaky patches all over your body that not only appear unattractive, but can feel itchy, uncomfortable, and even severely painful as well. Intensely dry skin often cannot be quenched by normal body lotions. This body lotion from Alba Botanica is specially formulated to soothe and reverse extremely dry skin. Infused with alpha hydroxy acids and formulated without harsh ingredients such as parabens, phthalates, and synthetic chemical fragrances, the lotion includes a blend of natural botanical ingredients that gently soothe your dry skin and intensely hydrate it to leave it feeling nourished and soft. Coconut milk is a natural moisturizing ingredient. It hydrates your skin while leaving it feeling refreshed and infused with a light, pleasantly sweet scent that wafts off your body all day long. Featuring a special ceramide-rich complex, this OGX body lotion helps restore the natural barrier of your skin to lock in moisture and hydration. 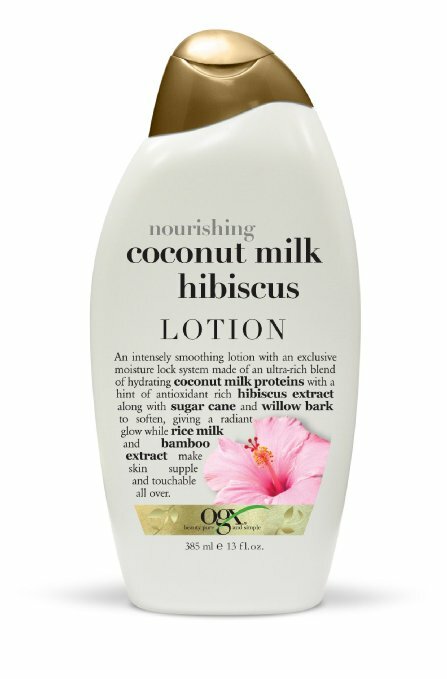 Infused with coconut milk, hibiscus extract, and a rich blend of natural antioxidants, the lotion helps you achieve bright, rejuvenated skin. Sometimes, skin that is extra dry needs more than hydration and added moisture to help it attain soft and smooth perfection; it requires healing. Dry skin in rough and flaky patches can cause minor cuts, scrapes, and breaks in your skin which can be painful and require a gentle, soothing lotion in order to heal. This Jergens body lotion is designed specifically to heal extremely dry and cracked skin all over your body. Blended with moisturizing vitamins C, E, and B5, it deeply penetrates through five layers of your skin to heal dryness deep within your skin and provide soothing hydration for up to twenty-four hours before reapplication is needed. Because it provides such intense healing hydration, the lotion is designed to be used on areas of your skin that are most severely dry, such as your elbows, knees, and heels. If you’re looking for body lotions for dry skin, consider this one. If you’re looking for a multi-use, versatile body lotion that can be used both day and night to provide lightweight and effective hydration to your skin, you’ve come to the right place. 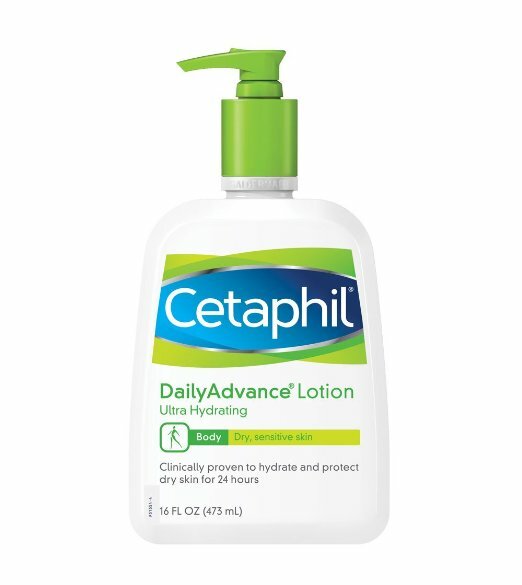 This is one of the best body lotion from Cetaphil which is a thin, lightweight formula that easily glides onto your skin all over your body and absorbs almost immediately into your skin without leaving any trace of greasy residue. It gives off no fragrance and provides light, invisible gentle hydration to even the most sensitive skin without leaving any mark except silky softness behind. Also you may need the best face lotions, check it out here. Body lotion should be something that you’re picky about; you need to invest in a top-quality body lotion that works well with your unique skin type and complexion. Use this list to choose from some of the best body lotions available and find one that keeps your skin soft, smooth, and healthy.